Most of the “mini-Simmons” shapes are built in the sub-6′ range. 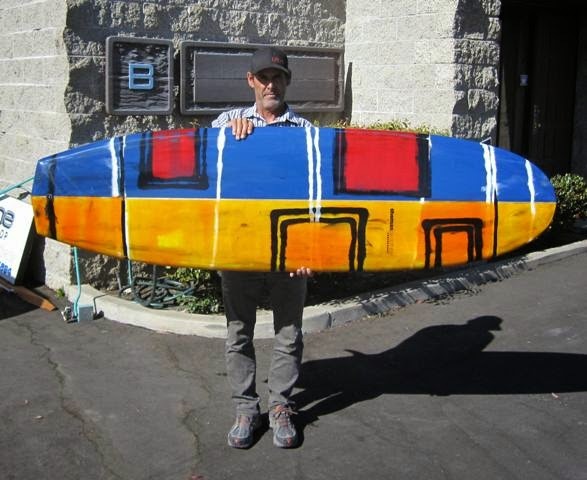 Simmons himself built boards with similar outlines from 9′ to 6′. This board is a good example of what I would call a “mid-sized ” Simmons shape. The board has the the low-aspect-ratio outline, flat rocker and tail concave that is Simmons-inspired. The extra length provides the volume desired by the customer, and the quad-fin set-up maintains the desired performance level. A great longboard alternative for the smaller waves of summer. It hard not to notice the unique color design of this board. All of the color work was done with resin-tints by master craftsman Ray Lucke. This is a labor-intensive, four-stage process that yields a radical, one-of-a-kind look. This close-up shows some of the color variations obtained by the process. The dimensions are 6’10” x 23″ x 3″ 60L. As stated above, this is a great summer and/or small-wave board. Multiply your weight by 0.316 to get an estimate of the volume you might need. May is here and the time is right to order your summer board!